This is long list. You may want to use the "find" feature in your browser (CTRL + F) to search. If you'd like more information about anyone in this database, you can email me from the link on the Contact Page. 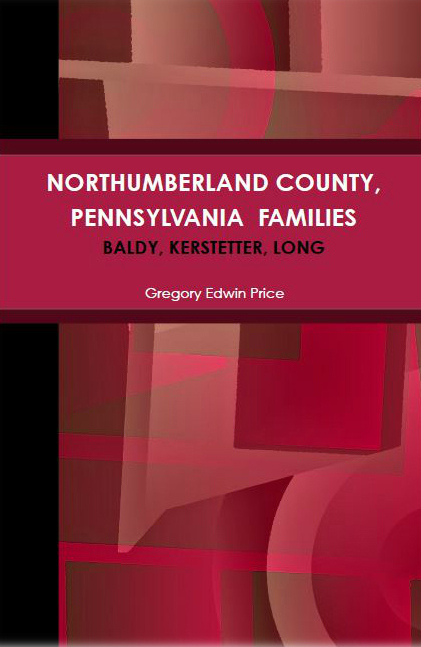 Joseph T (1864- ) "
This is my best effort to form the basis of a starting point for those interested in the Baldy, Kerstetter and Long families of Northumberland County, Pennsylvania. Relying primarily on original records, it is a simple six-generation descendancy for three of my ancestors; Paul Baldy, John Leonard Kerstetter and George Long. To purchase a copy, click on the book cover. This is a collection of over three-hundred letters that my Grandmother wrote to my father during WW II from October of 1944 to VJ Day. Daniel Engelman and his son, Jacob, came from Haarlem to Philadelphia in 1795. This is their story. Coming in 2019 !